Walk the Beara Way, a dramatic peninsula located in Ireland's south west corner and one of the country's best-kept secrets. With ever-changing views over the sea and the mountains that run along its entire length as it juts out into the Atlantic, this fascinating part of Ireland lies at the entrance to the magnificent Bantry Bay. 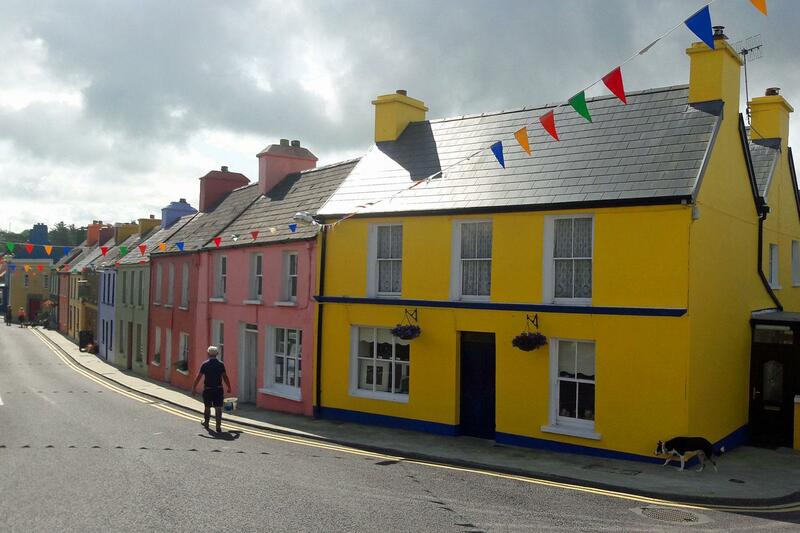 Walk through colourful fishing villages, such as Allihies, Eyeries and Castletownbere and on the islands of Bere and Dursey. Pass Bronze Age standing stone circles, see views over the famed Skellig Islands and glimpse a whale or dolphin as you walk on coastal paths. More reasons to enjoy this wonderful hiking adventure includes the warmth of the local people, the cosy B&B’s and the obligatory pint of Guinness to refresh you after every walk. Arrive in Glengarriff the southern gateway to the Beara Peninsula (2H20 local bus ride from Cork) and an ideal place to begin your Beara Way walk. This harbour is the place where the rugged beauty of the Beara Mountains meet the sea. Glengarriff has a mild sub-tropical climate and a nature reserve. If you can arrive early take the time to explore. If you are beginning your walk in Glengarriff you will walk to or from Adrigole, which is flanked by Sugerloaf Mountain. Adrigole is rich in historical and archaeological sites and the trail also passes close by standing stones as you descend into Adrigole village along an old coach road. From Adrigole you will walk along trails on the flanks of Hungry Hill, the subject of a novel by Daphne du Maurier which was based on her Irish ancestors. 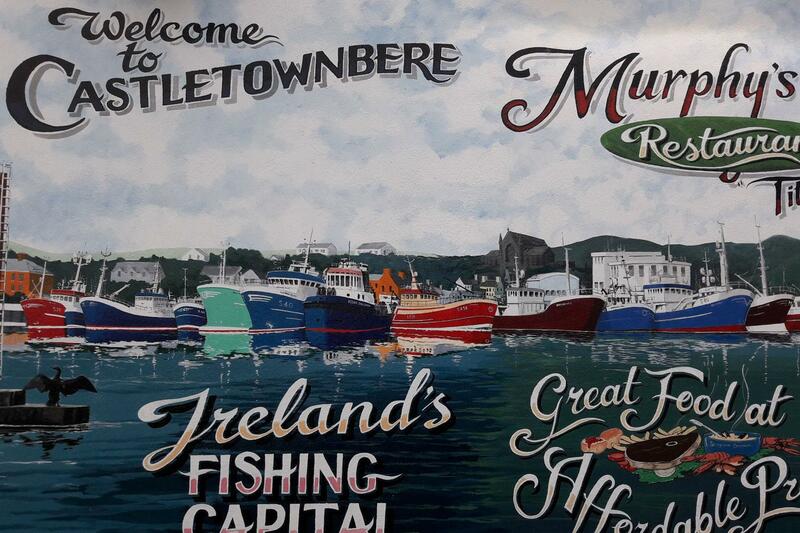 The trail then leads you down to the exceptionally pretty fishing town of Castletownbere. Here you will find plenty of restaurants and pubs playing Irish music to keep you entertained in the evenings.. 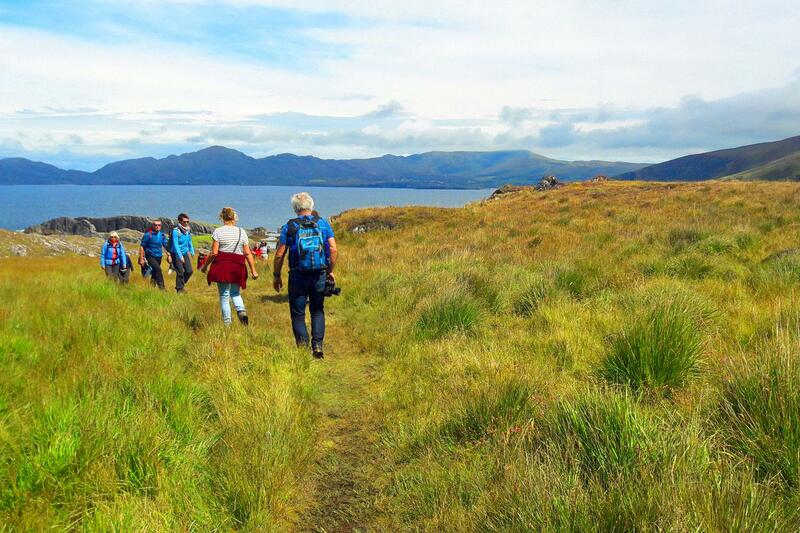 Depending on which itinerary you choose you may have the opportunity to walk on Bere Island. 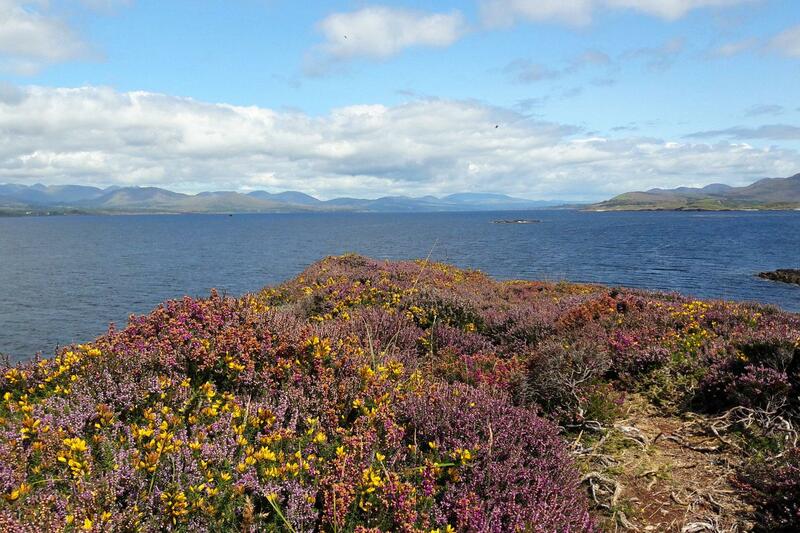 Take a ferry from Castletownbere which takes just 10 minutes and enjoy either a 10 or 20km loop walk. Bere Island, lying at the entrance to the magnificent Bantry Bay and guarding the harbour of Berehaven, makes for an exquisite day of walking. The Slieve Miskish and Caha Mountain ranges of the Beara Peninsula tower over the island providing a dramatic backdrop and despite its proximity to Castletownbere, the island retains a distinct, friendly and rural charm very distant from urban life. When walking from Castletownbere to Allihies you will pass through conifer forests and cross open hill terrain with stunning views. Pass under the peak of Knockgour at 481m and arrive in Allihies a tranquil coastal village surrounded by the stone remains of copper mines. Crushed rocks from the mines formed the beach. 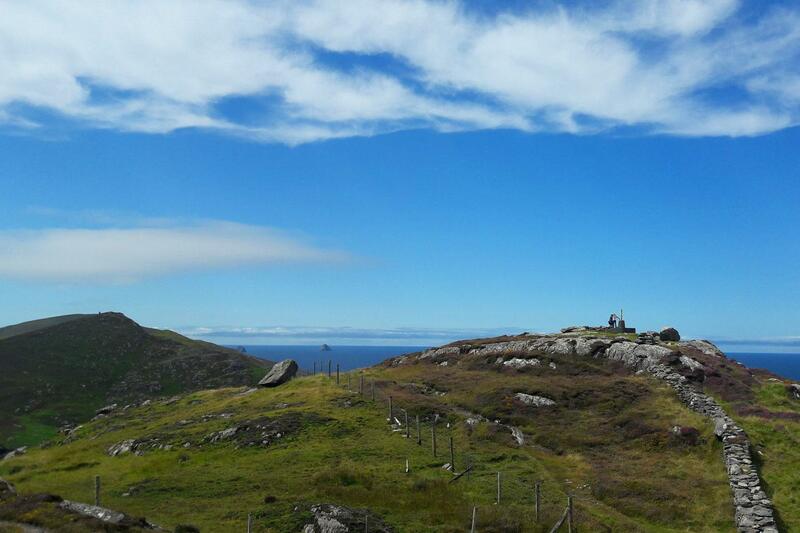 It is set in a spectacular amphitheatre of mountains overlooking the distant Skellig Islands. Either choose the itinerary that includes Dursey Island or add an extra night in Allihies so that you can walk on this island at the very end of the Beara peninsula. Connected only by cable car, take a walk around the island perhaps spotting dolphins and whales which are regularly seen in these waters. It is also a birdwatchers paradise. From Allihies head west on the slopes of the Mishkish Mountains to picturesque Eyeries one of the most delightful villages on the Beara Way. As you descend into the village you can see its very colourful bright pastel houses which give the village its character. Also enjoy the glorious sunset and ever-changing views across Coulagh Bay. Dropping down from the village to the coast, the Beara Way now follows the shoreline and you turn northward toward Tranimod and the Ballycrovane. Continue along the shore before turning inland and head over open hillside toward Lough Fadda (the Long Lake). Then ascend the hill above you and follow the ridge before crossing the estuary and following the quiet road into the village of Ardgroom. Leaving Ardgroom walk along a country road before passing a turning going to the Ardgroom Stone Circle. It is one of the best preserved on the Beara, with 8 stones still standing and constructed during the Bronze Age, roughly 4,500 years ago. It’s just a short diversion off the trail of about 1km to see it. Then pass from County Cork to County Kerry and a rise to a gap between the hills. Your route then brings you on past a stone circle at Cashelkeelty before descending to Lauragh and your stay for the evening. The parish of Tuoist/Lauragh is rich in beauty and heritage and bordered by Kenmare Bay to the north and the soaring Caha Mountains to the south. The next section takes you all the way to the lovely town of Kenmare. A transfer brings you to the trail near Drombohilly (not on the 8 day itinerary) and you ascend up toward the central spine of the Beara Peninsula. You are afforded views back down to the coast and across Kenmare Bay to the Iveragh Peninsula and Ireland’s highest peaks. Passing the Clonee Loughs you head into the scenic valley of Gleninchiquin. Turning eastward away from Lough Inchiquin you follow a back road uphill before breaking off across country and dropping over the ridge as you descend toward Dromoughty Lake and stone circle. 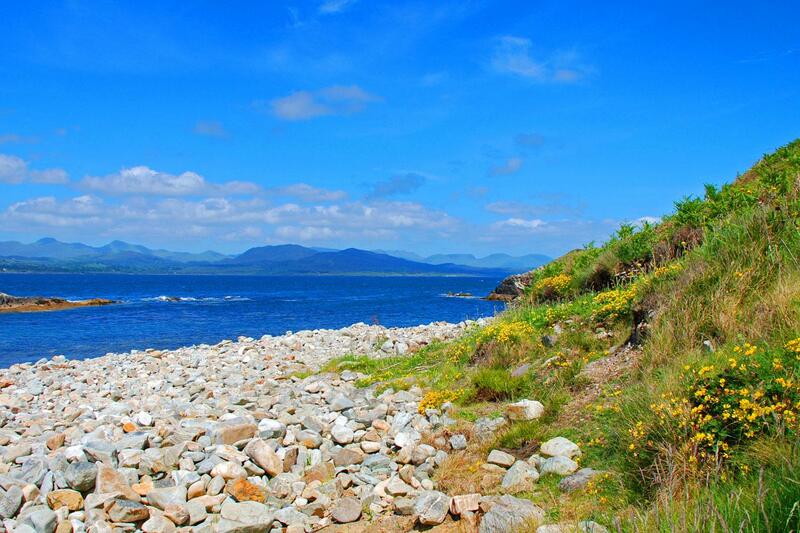 Now follow the route as it runs parallel with the coast and onward into Kenmare town. This little heritage town is rich in tradition and home to craft workers such as artists, weavers, potters and silversmiths. There is an array of brightly coloured shops and restaurants giving the town a cosmopolitan atmosphere. 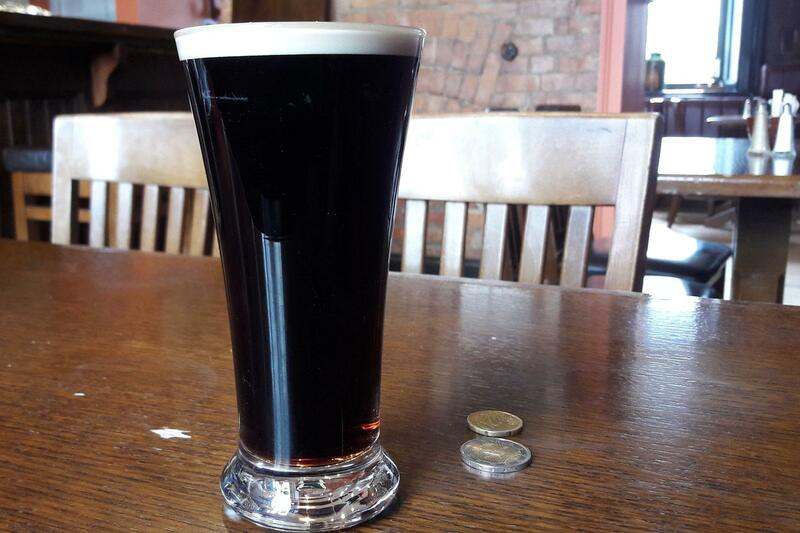 It also has a great reputation for some of the best food in the area and you can enjoy your final meal (and a Guinness!) in one of the towns many eateries. The accommodation on this tour is mostly cosy and comfortable B&B's. All offer a warm welcome to walkers and traditional Irish hospitality and delicious full Irish breakfasts. It must be noted that due to the lack of accommodations in Adrigole, transfers will be provided. We regularly use the following properties but may accommodate you elsewhere if these are not available. Many of our clients choose to add extra nights along the walk to sample more of the wonderful walking and attractions available on the Beara Way. Please contact our team should you wish to add extra nights along the way. Due to the route taken by the Beara Way, it is sometimes necessary to accommodate you a short walk away from the trail itself, as there is not always suitable accommodation close to the trail. Details will again be given on your accommodation sheet. A family run hotel dedicated to providing quality accommodation with rooms decorated to the highest standard of comfort and care. 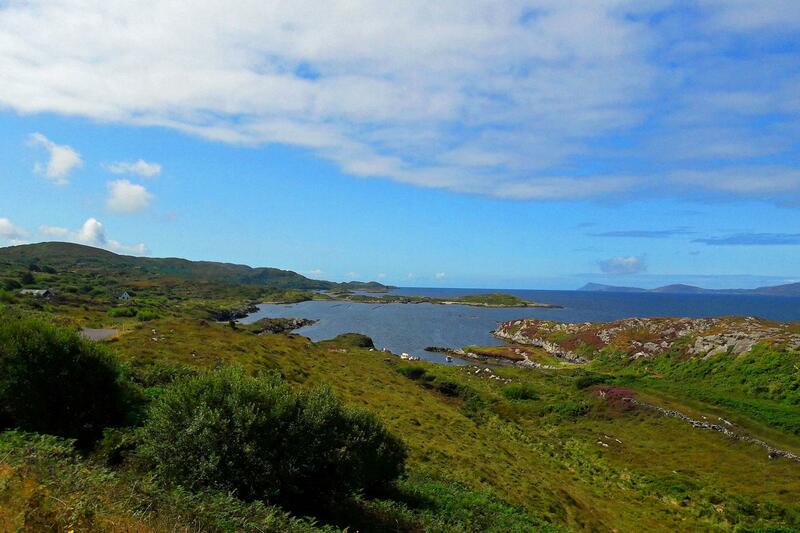 This B and B is located up the hill in the Castletownbere and has great views over Bere Island. You will be welcomed warmly. 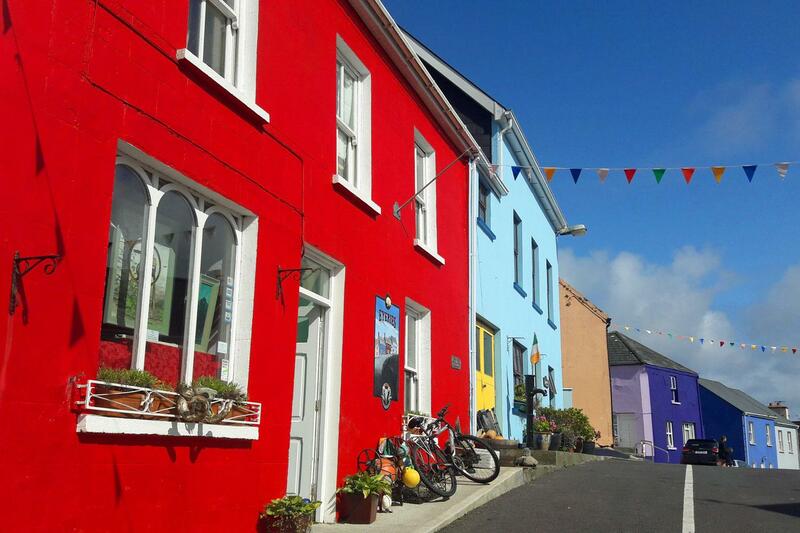 This B and B is located in one of the colourful houses in Allihies. Its large rooms are great, some with sea views.Enjoy a sumptuous breakfast. Sit and relax in the spacious sun-lounge at the front of Coulagh Bay House, and watch the sun set. Comfortable rooms in a lovely setting. A 2 minute walk from the village of Ardgroom your delightful host offers spacious comfortable rooms and modern bathrooms. Mourlin Lodge is run by the lovely Noreen and family. The rooms are spacious and comfortable and breakfasts are to die for. Rockcrest House is just a few minutes walk from the charming town centre of Kenmare. The rooms here are very well maintained and spacious. This walking holiday is best enjoyed between May and October. You can start on any date that suits your travel plans and you will find availability on our website. The Beara Way is popular and in some places there is limited accommodation choices so it is best to book as far in advance as you are able to. A hearty breakfast is included each morning, which usually includes choices of cereals, toast and yoghurts. A full cooked Irish breakfast is also provided and cooked to order. Lunch and dinner are not included so you are free to choose from the available options. Most of your accommodations will be more than happy to provide a packed lunch on request and this can be booked on arrival. Alternatively you can buy lunch at local shops or stop in a café. Your route notes will have more specific information on whether you will need to take a packed lunch on a walk or whether there is a café, shop, etc en route. This route is quite well way-marked. Detailed route notes and GPS data will be provided for you via the Macs Adventure App. Further information will be provided upon receipt of your booking. As some of these areas are quite remote it is advisable that you are a regular walker in this kind of environment. Our itineraries are graded moderate overall. However depending on the itinerary this can be anywhere between easy to moderate and moderate to strenuous. These itineraries are suitable for regular walkers but you will need to be physically fit as there are some steep climbs. The terrain consists of mainly quiet tarmac roads, bog roads, cliff and woodland paths and open moorland, some sections of which can be quite rough and remote. During rainy weather some of the trails can be very muddy, boggy and waterlogged, so be prepared to get your boots wet and wear very good quality walking and waterproof boots. Wearing gaiters is also a good option. As there are no “public rights of way” in Ireland you will need to expect some road walking. The roads that the Beara Way follows are generally very quiet and sometimes farm tracks but you will have to walk on tarmac every day as there is no avoiding this. However this in no way creates a negative experience, it is just what you have to expect when you walk in Ireland. The closest international airport is Cork Airport. This airport is served by a few different airlines such as Ryanair and Aer Lingus from cities like as London, Manchester, Glasgow, Munich, Zurich and Amsterdam. When you arrive you can take a #266 bus from the airport to Cork Parnell Bus Station. Buses from the airport run approximately every half an hour. From Cork Parnell Bus Station you can catch a bus to Glengariff. There are 3 buses per day in the early morning, afternoon and early evening. The journey takes about 2H20. If you fly into Dublin is it also possible to get a direct train to Cork from the centre of Dublin which takes about 2H35. If your tour begins in Castletownbere a private transfer from Glengariff to your accommodation in Castletownbere is included. Please let us know of your arrival in Glengariff as soon as possible after booking. 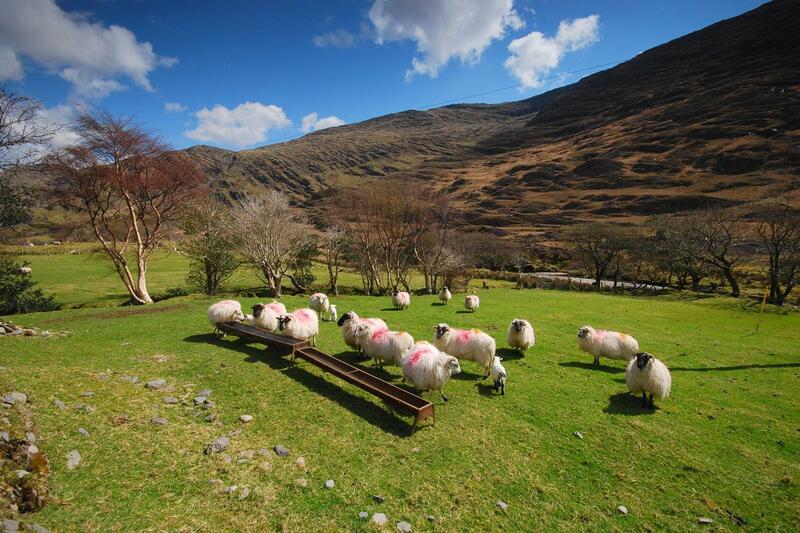 On return to Cork you can get a taxi to Glengariff and take the same return journey. However a less expensive option is to take a bus from Kenmare to Killarney. During week days there are buses 3 times per day, but only twice on Saturdays and once on Sundays, so you will have to plan accordingly. The journey takes about 45 minutes. From Killarney you can take a train to Cork, which takes approximately 1h30 to 2H depending on the stops. There are also direct train to Dublin from Killarney if you wish to take this option. Once again the Bus Eireann website is the best one for making your travel plans. 24/7 telephone support from our UK office. Our itineraries are graded moderate overall. However depending on the itinerary this can be anywhere between easy to moderate and moderate to strenuous. These itineraries are suitable for regular walkers but you will need to be physically fit as there are some steep climbs. The terrain consists of mainly quiet tarmac roads, bog roads, cliff and woodland paths and open moorland, some sections of which can be quite rough and remote. During rainy weather some of the trails can be very muddy, so be prepared to get your boots wet and wear very good walking and waterproof boots. Wearing gaiters is also a good option. Traditionally April/May has always been the most popular time of year because the theory goes that the weather is better. Although we believe any time between April and October offers a wonderful experience. Day 1: Arrive Glengariff and overnight. Day 2: Transfer to Adrigole, walk to Castletownbere, 22 km. Day 3: Bere Island Loop Walk, 10 or 20km. Day 4: Walk to Allihies, 13km. 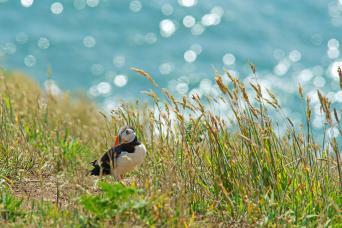 Day 5: Walk on Dursey Island, 17km. Day 6: Walk to Eyeries, 12 km. Day 7: Walk to Ardgroom, 13km. Day 8: Walk to Lauragh, 11km. Day 9: Transfer to Drombohilly, walk to Kenmare, 18km. Day 1: Casteltownbere and overnight. Day 2: Walk to Eyeries, 14km. Day 3: Walk to Ardgroom, 13km. Day 4: Walk Lauragh, 11km. Day 5: Transfer to Drombohilly, walk to Kenmare, 18km. Day 2: Transfer to Adrigole, walk to Glengariff, 20 km. Day 3: Transfer to Adrigole, walk to Castletownbere, 22 km. Day 4: Bere Island Loop Walk, 10 or 20km. Day 5: Walk to Eyeries,14 km. Day 6: Walk Eyries to Lauragh via Ardgroom, 24-26 km. Day 7: Walk to Kenmare 24 or 28km. There are 3 different itineraries to choose from on the Beara Way and your choice will depend on your fitness level and how long you want your holiday to be. However on all the itineraries you will experience fantastic coastal and hill walking with stunning views not only over the Beara Peninsula itself, but also over the Iveragh Peninsula and all the way to the Skellig Islands. Enjoy staying in cosy B&B’s offering a very hearty and warm Irish welcome.